The longest lasting roof, guaranteed! Frank Fiala Roofing, Inc.
Frank Fiala Roofing, Inc. is an experienced, licensed C-39, bonded and insured professional roofing contractor. Frank Fiala Roofing, Inc. specializes in re-roofing projects. We are a well known professional roofing company. We know what it takes to successfully install a quality roof system. Let us help you protect your assets and investments. 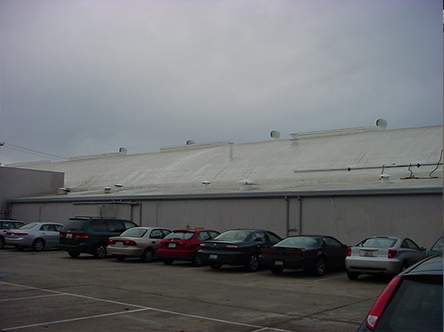 Most commercial or industrial buildings have flat roof structures with Built-up roof systems in place. As we have moved into the new millennium single ply products have become more common. Single ply products are more state of the art sometimes being called the roof system of the future. 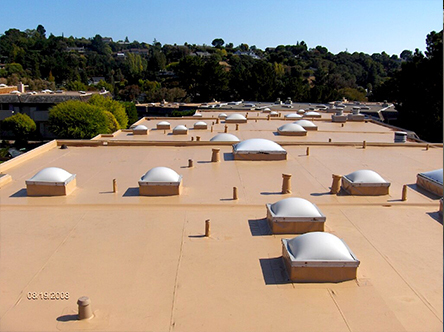 Built up roof systems are built in place, using multiple layers of fiberglass reinforced plies adhered together with either hot asphalt or cold applied adhesive. Surfacing can be polyester reinforced cap sheet, gravel, or coatings. Correctly installed Built up Roof systems last 15-25 years. 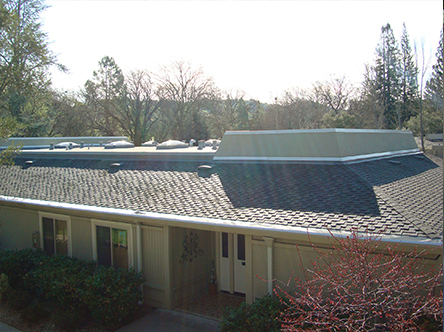 Single ply roof systems are made of many types. PVC, TPO, EPDM to name a few. All of which allow faster, cleaner, applications without the use of smelly tar equipment or open flame equipment. We agree the PVC roof product is a more proven roof system as the formulas have not changed for decades. Correctly installed some PVC products will last 25-30 years. TPO roof products seam to be getting better but have not proven their life cycles since the last formula improvements. TPO products expected life expectancy is 15 years. Both products are Polyester reinforced membranes meeting or exceeding Title 24 compliant requirements. Both products are light weight with superior seam strength. Known as “cool roof systems” single ply systems are becoming more known as they take a larger part in the roofing market. Low maintenance costs. Excellent resistance to environmental stresses including ozone and UV exposure and extreme weather conditions. Resistance too many chemicals, including restaurant grease, or fats. 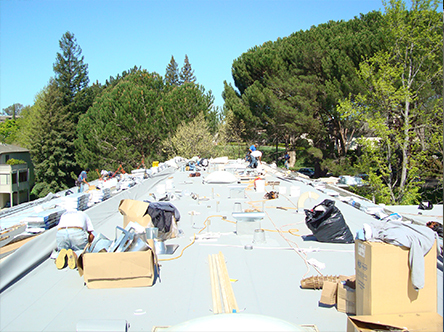 Single ply Membrane can be applied during inclement weather if necessary. Future work adding or moving equipment is easier and less cost. Reflective surface color reduces energy costs. Selecting the right Professional contractor for your roof project, can make the difference in a successful project or a horrifying costly experience. Rather your project is a simple single family home or a multi-unit residential complex this is one of the most critical financial decisions you will make regarding your property. Initial price alone should not be the deciding factor. In most cases the cheapest price results in the worst job. This leads to additional work by a qualified contractor, in some cases a complete new roof system. 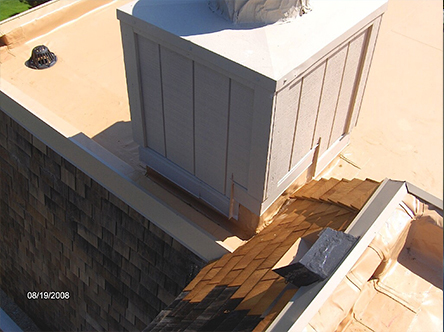 Our roofing team is not just experienced but trained and certified by material manufacturers. We do work per the manufacturer specifications. We replace all roof related flashings with every job. If we need to break out the stucco that is OK, since we do it on every job. 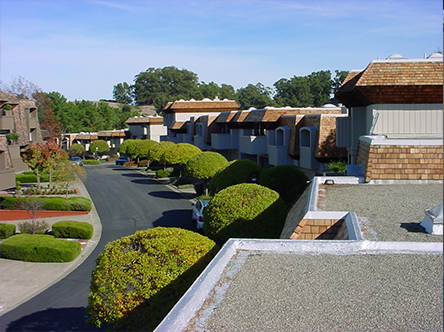 We have been re-roofing single family homes to Multi-family HOA for 20 years. We know what it takes to strike fast with a well thought out plan, keep the project moving at an efficient pace, and close out the project in a timely manner. We specialize in re-roofing steep slope as well as low slope. With our experience and credentials we are able to offer the Manufacturer 15 and 20 year extended warranties single family residence or multi family residence. We include our 10-year written transferable workmanship warranty’s on all new roofs. 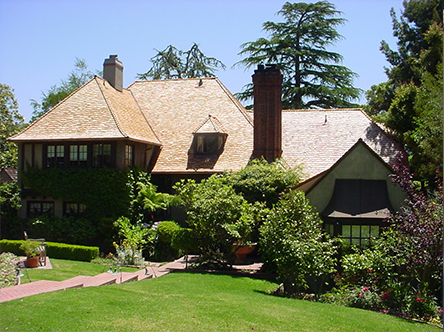 Fiberglass Reinforced Asphalt shingles provides a dimensional textured appearance. There is a large variety of styles and colors to choose from. Asphalt shingles are class “A” fire rated with warranties that range between 30 years to lifetime. Cedar shingles and shakes are ct from Cedar trees. 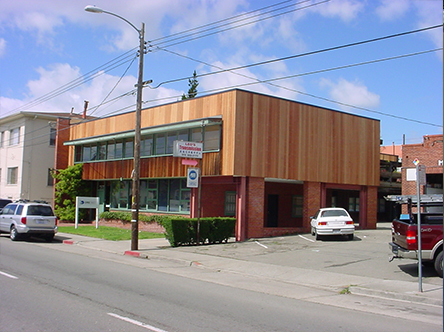 This time tested natural product will enhance the appearance of your building rather residential or commercial. Fire treated shakes and shingles Class “A, B or C’ are available providing excellent fire protection fire resistance and weathering. Warranties range from 25 to 50 years. Tile provides many options in style, and color. Available in concrete or clay, tile roofing can enhance the architecture of most any home or building. Tile provides protection from fire, high winds and blistering heat while being environmentally friendly. Tile is available in standard and light weight with a 50-year transferable material warranty. The tile itself does not keep the water out. Water will get under tile causing leaking through the underlayment system if it has not been installed by a qualified installer. 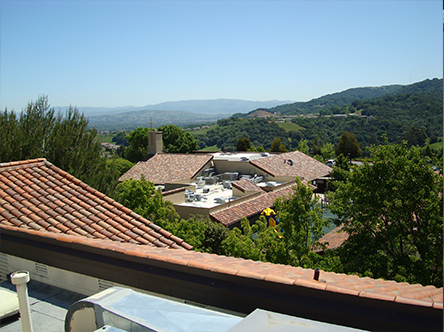 Tile roofs require proper flashing details and underlayment applications, to assure long-term performance. Although tile is one of the best long term products available, there is maintenance involved to keep the roof system water tight. Known as "cool roof systems" single ply systems are becoming more known as they take a larger part in the roofing market. Frank Fiala Roofing, Inc. is an experienced professional roofing contractor specializing in commercial buildings of all types, industrial buildings, single family residential, multifamily residential, home owners associations (H.O.A. ), providing a quality job at a fair price, and the best warranty available in today’s market. Inspect and evaluate your roof structure and roof system. Determine and recommend the best roof solution for your building and personal needs. This could include a new roof system or repairs, maintenance or a roof coating system. Bring to your attention any details or problem areas, explaining them in a way so you understand them. This will help you in making an informed educated decision. Provide a quality job at a fair price. Provide the best warranty available in today’s market. Frank Fiala Roofing, Inc. is known for completing quality roof installations, while keeping a clean safe work environment. Our staff is well trained in all aspects from roof removal, to installing your new roof, to providing you with all of the completed documents. We work at the beginning of the project with Material manufacturers to assure the finished product meets or exceeds industry standards. This is how great roofs are built knowing they will last the manufacturer expected roof longevity. Our field Staff includes two supervisors which oversee approximately 30 full time employees. Our supervisors inspect each job site daily communicating with the owner or owner’s representative. Our Journeyman roof applicators are Manufacturer certified roofing installers. All of our employees are paid hourly, not piece work. Our employee’s are paid by the quality of the work, not by how fast they put the roof on. This is the best way to build a quality installed roof system without cutting corners. Frank Fiala was born and raised in the East bay. Frank Fiala Roofing was formed in 1989. In January of 1994 Frank Fiala Roofing became incorporated. Including prior experience in the roofing industry and Carpentry trade, together their experience exceeds 50 years. 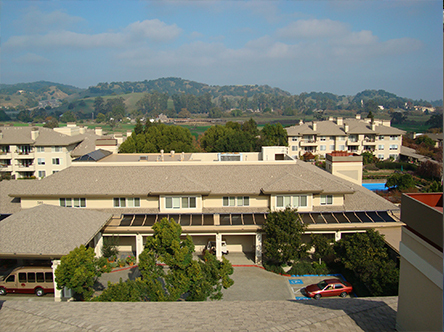 Beginning in residential roofing they have grown the business to include Commercial/Industrial, Multi-tenant apartments and Condominiums. 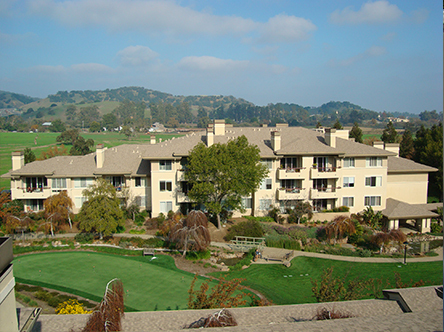 Today’s business consists of approximately 50% condos, 30% commercial and 20% residential. The same work ethic used in 1989 "doing it right the first time" is used today. We carry Workers Compensation insurance, General Liability insurance which includes residential condo and commercial coverage. We are also bondable. 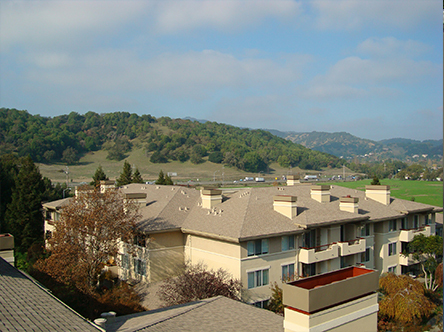 Our office is located in Pleasanton CA. We do not work out of our homes or pick up trucks. We own all of our vehicles and equipment. This combined with a great history of workmanship, makes us financially secure, so you can be sure we will be here when you need us.